The pia mater becomes the tela chorioidea when it is carried over the inferior part of the roof or posterior wall of the fourth ventricle of the brain, and the portion of the pia mater from which the chorioid plexuses of that cavity are created is attached to it. 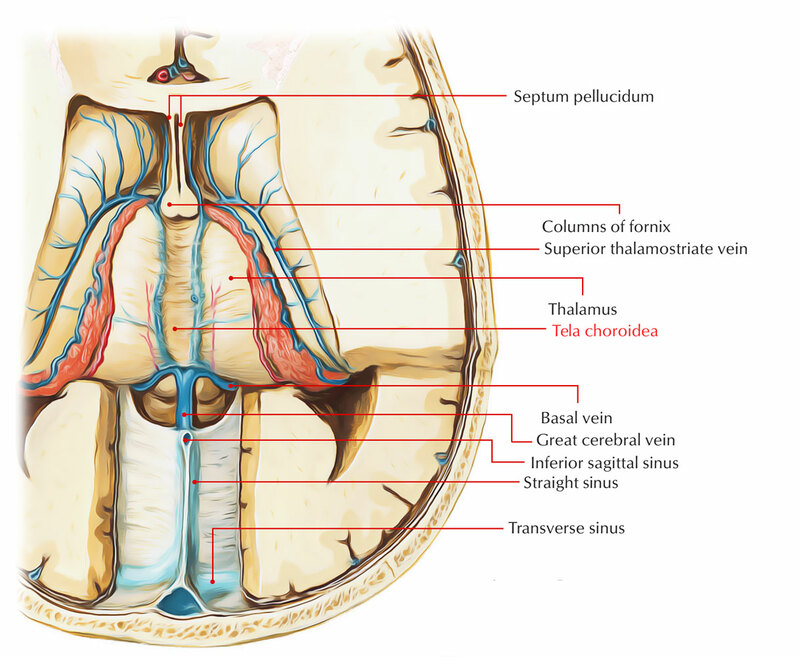 The tela chorioidea is a crease of pia mater which is entrenched into the brain, for becoming reclined over the third ventricle and in order to project into the lateral ventricles in the form of chorioid plexuses. The tela chorioidea arises amongst the overlying body of the fornix as well as the underlying epithelial roof of the third ventricle along with the two thalami. Subarachnoid trabecular tissues along with blood-vessels are located In the middle of its two layers. Complete covering to the chorioid plexus is given by the epithelial lining of the ventricle. Under surface of the tela chorioidea, from median junction two small chorioid plexuses travel backwards as well as project down within the third ventricle, these are called the chorioid plexuses of the third ventricle. The base of tela choroidea is located below the splenium of the corpus callosum where the two coatings of the tela divide and afterwards on the surface of the brain by exiting via a fissure referred to as the transverse fissure become constant with the surrounding pia mater. The chorioid plexus of the central part of the lateral ventricle borders the tela chorioidea of the third ventricle alongside each rim, which from below cover of the free border of the fornix protrudes within the ventricular cavity. The chorioid plexus is constant with the same structure within the inferior horn of the ventricle posteriorly, whilst it narrows to a large extent anteriorly, and behind the epithelial layer which lines the interventricular foramen becomes constant over the median plane with the equivalent plexus of the other side.